The term "shamanism" is a hotly debated topic in the discipline of anthropology. Half of the field either uses it to denote "practitioners of animism" in indigenous societies (replacing the mid-20th-century terms like Witch Doctor or Medicine Man) or practitioners who come from Manchu-Tungus groups in which the word originated. My approach is the later. Either way, the one thing that is common to both is that these groups are hunter/gatherers that rely upon different cycles of nature. Solstices and Equinoxes are found only in ancient and modern agrarian societies who mark the passage of time with the position of the sun through its yearly cycles. Shamans mark their time post through the migration of land or aquatic animals for their basic survival needs and never use the solar demarcations to celebrate their annual festivities. Their yearly rituals marked the beginning of salmon runs, the return of migratory birds, and the winter chase in which land animals such as deer and elk were hunted to provide larger quantities of food to last throughout a period where the yearly ice sheets curtailed their ability to fish. Spirits of the water, land, and air were the recipients of their offerings. Rather than using an arbitrary calendrical date, festivals were performed when the migrations began which could vary depending on climatic conditions that varied from year to year. The Lunar calendar marked their time periods and their months were named after specific land or aquatic animals that would be arriving in their territories. Except for the spirit of water, the primary portal for offerings was conducted through specific forms of fire rituals which contained their own rules and taboos. Shamans held no unique role in any of the festivals. Everyone knew how to properly perform the rituals which insured the continuation of his or her clan. Migratory patterns, found in nature, are more complex, nuanced, and layered within indigenous societies. These patterns also exist with our own urban environment where the wild bird and animal people still live amongst us. I always like to encourage people to be aware of observing these cycles around their own home and shift their daily lives not only to the seasons of light and dark but to the reliability of nature in her full expression of birth, growth, and decay in the extraordinary dance called life. Jan Van Ysslestyne, M.A. is a fluent speaker of the Manchu-Tungus language spoken by the Ulchi culture. She lectures on Classical shamanism through the University of Washington, Burke Museum, Antioch, and Bastyr University in Seattle, Washington. Her publications have appeared in both Shaman's Drum and Sacred Hoop magazines. She is a contributing author to the book First Fish, First People, Salmon Tales of the North Pacific Rim, University of Washington Press. She continues her research into the pre-technical medical practices of indigenous cultures in the territories of southeastern Siberia. 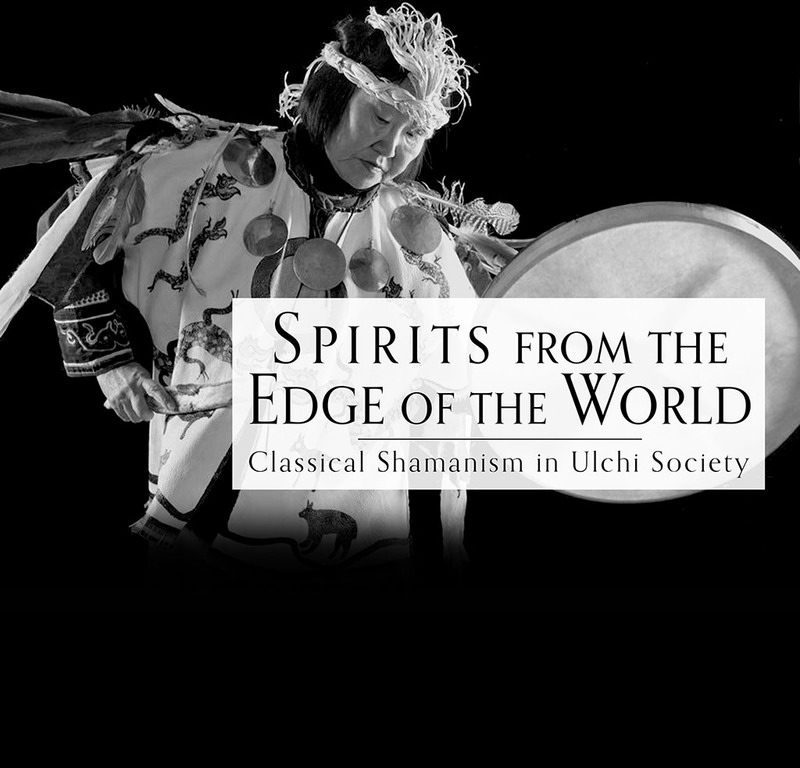 Her current book "Spirits from the Edge of the World, Classical Shamanism in Ulchi Society" is available at East West Bookshop, where she also does astrological readings by appointment. 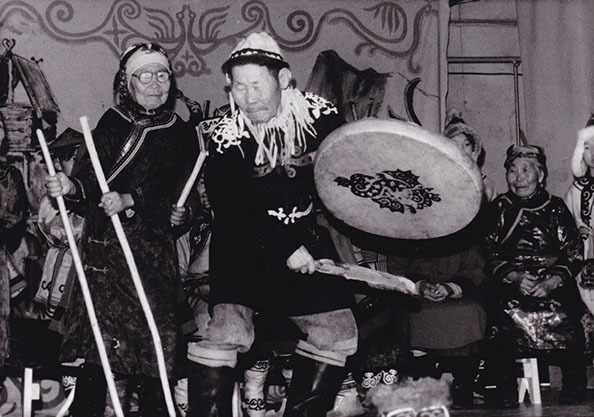 PHOTO: Shaman grandfather Misha dancing in village healing ceremony.